With the Maui Aloha Aina's annual Maui Body & Soil Health Conference coming up on January 14,15,and 16, there is not much time left to sign up and purchase your registration for this highly popular event. Sign up here! Being the 10th annual conference Maui Aloha Aina Association has decided to add a third day and even more valuable information and expert speakers. All of the speakers could easily take up a few pages to just highlight their expertise ands accomplishments alone. 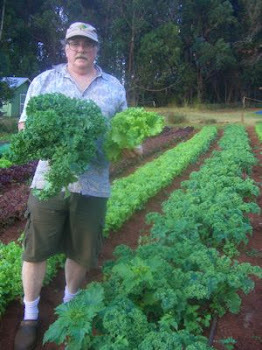 JUST ADDED to the Maui Body and Soil Health Conference as a PRE-CONFERENCE BONUS!!! Peter Hirst will be brought in to train Mauians on building & operating an “Adam Retort” Bio Char facility during a pre-conference workshop, while also presenting during the three days at Body & Soil on the Pyrolysis process. This will be the FIRST Adam Retort Facility in the state, with the intention of having them built in every agricultural district on Maui and throughout the State of Hawaii. This being said, I am hoping to highlight each person in separate blog posts. In no particular order, but because my research into producing energy from various technologies has led me back to the Adam Retort and the foremost authority on this technology, I will start with Peter Hirst of New England BioChar. Peter Hirst's company has purchased the American rights to build the Adam Retort, a design that Chris Adam put in to use in places like Niger, India, Burundi and Peru. Chris Adam of Adam and Associates won a Silver Award in the Focus Energy 2006. Here is an excerpt written by Chris Adam and can be found here. "Last October I installed for the first time in Europe a unit of the "adam-retort" a more environmentally friendly low-cost charcoal production system for bio mass. More on Chris Adam's Retort can be found at http://www.biocoal.org/3.html. thereby having a neutral effect on CO² exchanges. 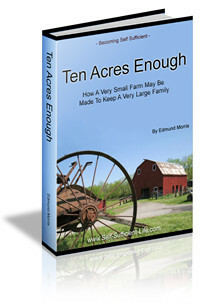 1) High economy and better efficiency of approx. 35% to 45% (Instead of about 18% efficiency compared to the traditional systems; calculated from dry weight). 2) Recycling and clean combustion of the pyrolysis gas during the 2nd phase of operation (retort-system) results in a low-emission of carbon monoxides during the charcoal production! 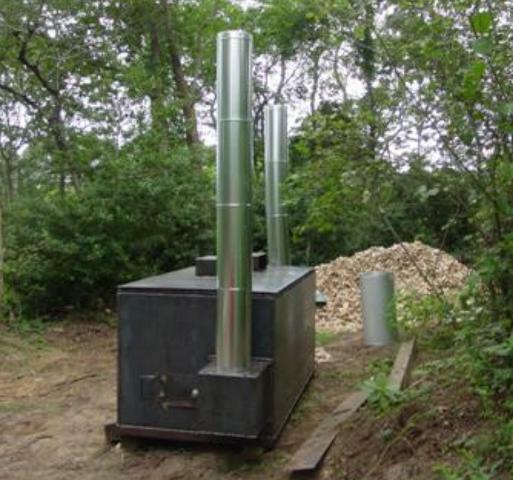 The effective carbonization of the biomass takes only 10 hours. A retort system reduces the emission of harmful volatiles into the atmosphere to about up to 75%! (Compared to a traditional earth-mount kiln). 3) Low investment costs of about ~500Euroand a simple construction with locally available materials. (Costs were about 300 Euro in Kenya in 2004, but now with raising steel prices costs increased...) . 4) About 3m3 of biomass (corresponding to approx. 600kg to 900kg wood, coconut shells, compacted saw-dust briquettes, etc., dry weight, water not counted, or ~1-1,5 tons of wet wood) can be converted to up to 350kg of charcoal per batch. Per week about 3 batches of biomass can be carbonized which is corresponding to about ~1 ton of charcoal per week and unit. 5) An effective 30 hour total production cycle (known as batch) and a simple operation of the plant result in an increased income for its operators. The right system to be used at forest projects, sustainable energy-wood plantations and charcoal makers in rural areas or for semi-industrial production. 6) Only waste wood or residual biomass needs to be burnt (~50kg) in a separate fire box to dry and heat the wood and initiate the carbonization process during the 1st phase. 7) With an extended version the famous "white charcoal" should be possible to be produced? 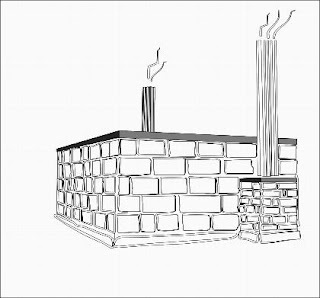 This is an adapted Japanese technology to produce high quality and strong charcoal. Also the production of "wood vinegar" is possible during the 1st phase of operation." perspective drawing of the "adam-retort"
Just a little brightness to fill some space.